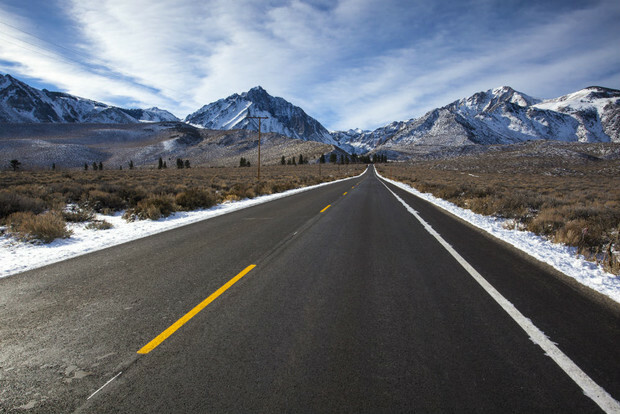 The road to Mammoth Lakes. Ben Girardi photo. There’s a whole lotta nothing on the way to Mammoth Lakes. Nevada’s scrubby brown hills undulate for miles, punctuated here and there with snowy mountains and the occasional old mining town. 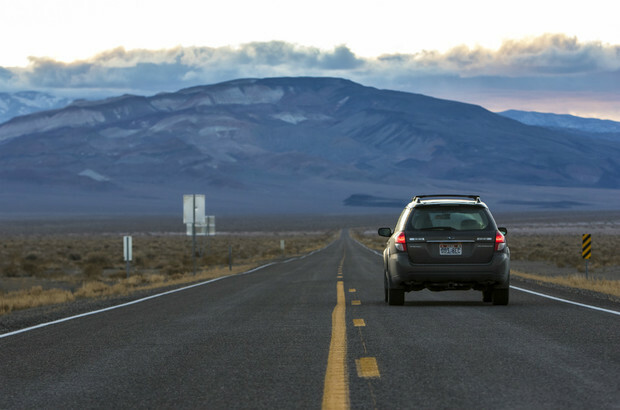 When you finally hit the Eastern Sierra, it’s unexpectedly dramatic. You hit the T-intersection on US-395 after Whitmore Hot Springs. The flat, sagebrush-dotted landscape falls away, and a north-to-south wall of much-bigger-than-you-anticipated peaks greets you. Like a lot of beautiful places dominated by iconic ski resorts, the backcountry here is an unsung gem. The statement, ‘I’m headed to Mammoth,’ usually garners a response about the resort’s famous terrain park, or how said terrain park steals attention from the resort’s steep-and-deep freeride zones. The resort and the town seem interchangeable in this conversation, and literally zero people I spoke to ever mentioned it as a splitboarding destination. 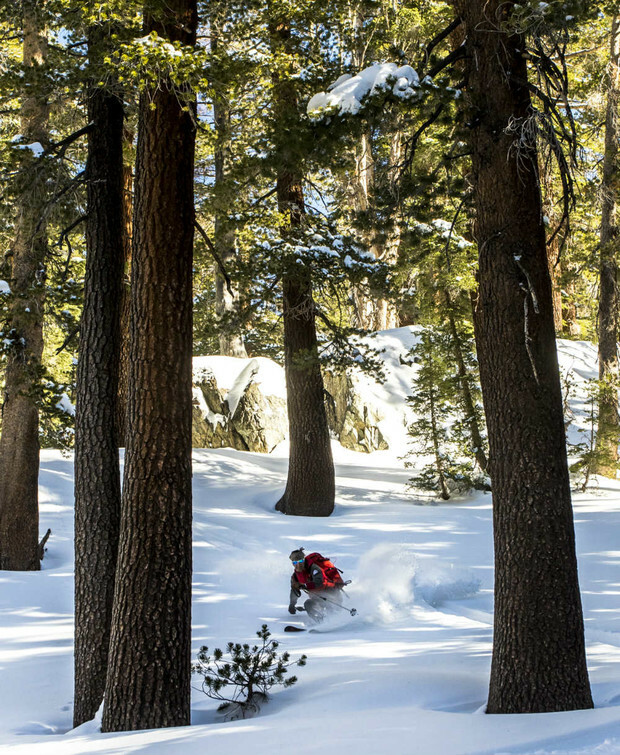 It’s been my experience that these kinds of places--resorts with huge numbers of tourists uninterested in hiking for turns--are often the best, least-visited backcountry zones. A year ago, someone put me in touch with Sierra Mountain Guides. California had seemingly no snow all winter. Reschedule after reschedule, our tentative trip to hike the eastern-central nook of this 400-mile-long range faded into the frenzied powder chase to other places--first southern Colorado, then northern, then back home to Utah, onward to Jackson, and back to Utah again for the last big storm of the spring. Chasing Howie on the way to Mammoth Crest. Ben Girardi photo. Early this winter was a much different story. Unlike a lot of my early seasons, which included going to some snowboard training camp in Colorado or similarly high altitude place to run gates, hit jumps, and freeride icy ribbons of death in preparation for comp season, I started this year writing a month-long research project and splitboarding mostly low tide conditions. As I finished up writing and feebly attempted to prepare for the season, storm cycle after storm cycle crushed Mammoth Lakes. I had a window, the snow cooperated, and we finally had lift off. Still chasing him. Ben Girardi photo. After a nine-hour drive from Salt Lake City with photographer Ben Girardi, I meet Lara Kaylor from Visit Mammoth and Howie Schwartz from Sierra Mountain Guides at Stellar Brew & Natural Cafe. We pow-wowed briefly about the zone we’re going to visit, check gear, stash extra batteries, and then caravan to the parking lot at the Lake Mary Road trailhead. 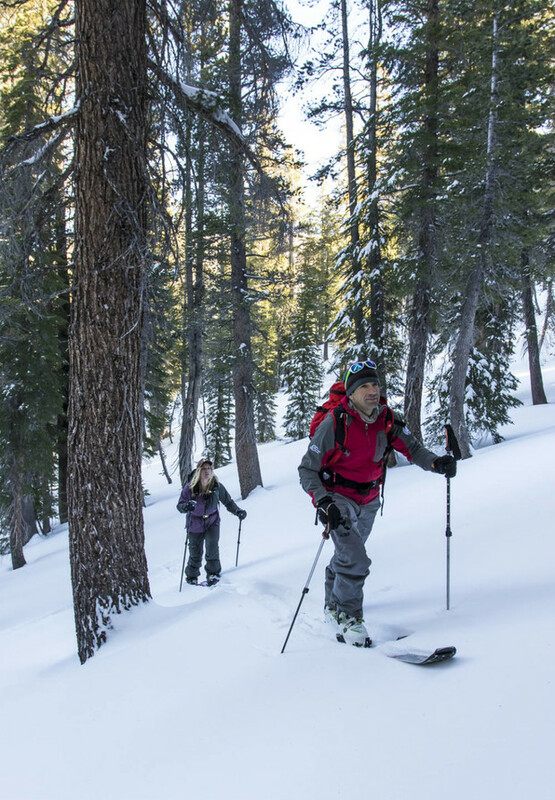 Skinning from nordic track to rolling treed terrain, we slowly trekked up the Mammoth Crest toward TJ Bowl. 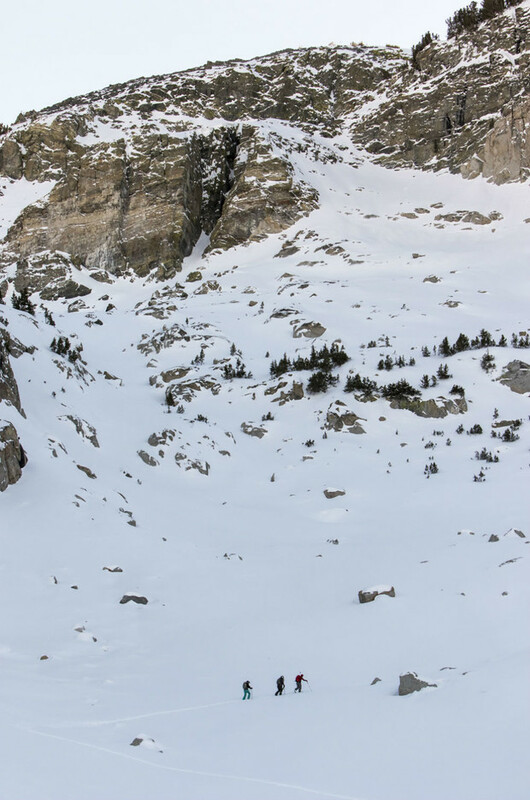 A scenic transition on Mammoth Crest, Ben Girardi photo. I lost patience, not knowing where we were and where we were going, and we dropped into the trees and cruised through knee-deep, dense snow. Turning out of the trees, we entered the runout of the bowl. Frontside slash through the trees. Ben Girardi photo. Howie laying down a turn through the trees. Ben Girardi photo. The towering open face invited us. Post-lunch, the shadows draped over the cool, blue snow. We transitioned quickly back, skinned, kickturned, skinned, kickturned until Howie pointed out that we’d hit our time limit. We needed to drop, and drop now. We transitioned just next to a set of tiny chutes. Sharkfins poke out in the upper bowl’s snowpack. Howie, Lare, and I climbing TJ's Bowl. Ben Girardi photo. Howie dropped in the chute next to me, setting perfectly closed s-turns and veering skier’s left to a rollover where Lara waited for us. I dropped next, slicing big, open turns down the fall line and giggling like a buffoon. Closing in on Ben, I aired over our skintrack, caught my nose in the dense snow, and tomahawked, which he informed me in between laughs that he did in fact capture. Howie dropping in. Ben Girardi photo. Sans photographer and Lara, I met Howie again at Stellar Brew for a protein shake and latte. We carpooled to June Mountain. 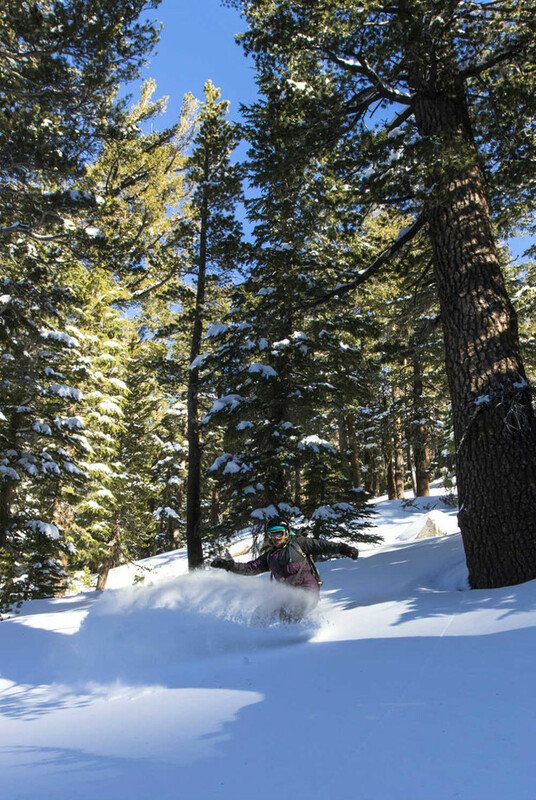 Nestled in between mountains with 5,000-foot descents, Howie argued that June Mountain offered the best lift-accessed backcountry terrain in the country. It didn’t make sense to me that such a remarkably flat, generally empty ski area could access anything other than cruisy groomers. We slid through a mellow glade and entered into a broad meadow flanked by peaks. As we transitioned back, Howie pointed out what the mountains’ roof pendant formation. 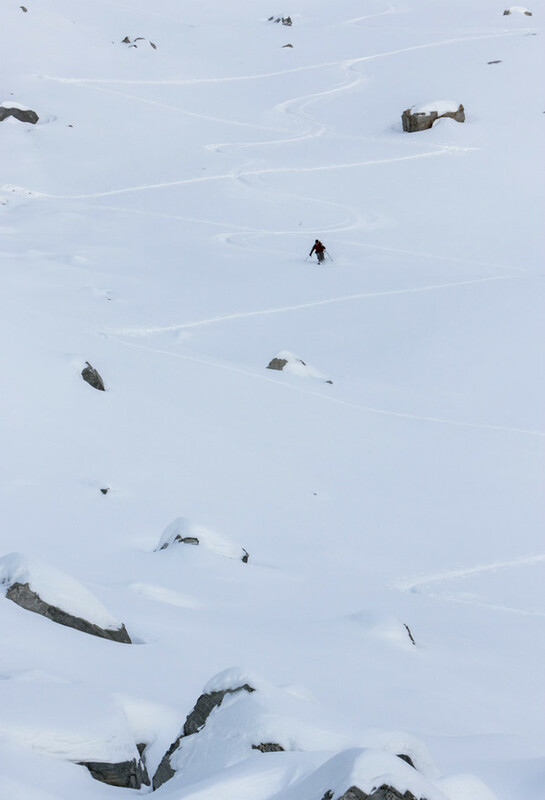 Uplifted from the seabed of an ancient ocean, the soft rock slowly eroded, creating cracks and pockets for great skiing throughout the Eastern Sierra. We skinned to the base of the Negatives, and booted straight up the face in thigh-deep snow. The views unfurled near the top of the Negatives. The valley floor, Howie pointed out, is at about 4,000 feet and the peaks that surrounded them reached 14,000, making them the most prominent in the lower 48. The road home. Ben Girardi photo. Get Nat Geo Illustrated Map #809 Mammoth Lakes and Mono Divide Trail Map. Right downtown, the Sierra Nevada Resort has absolutely baller rooms with fireplaces, kitchenettes, spa-level bathrooms, and the comfiest king-sized beds you’ve ever rested your sore back on. Bonus points for the giant hot tub. Like yummy sandwiches, small plates, and local microbrews? Try the new joint, Mammoth Tavern, a bustling, all-wood pub for apre-ski. 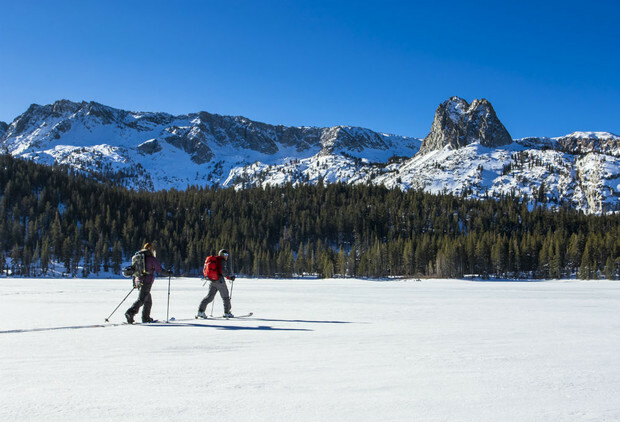 For the past 20 years, Howie Schwartz of Sierra Mountain Guides has been taking backcountry enthusiasts into the Eastern Sierra. An experienced ski mountaineering guide and avalanche forecaster, this is the dude. If you don’t know where you’re going, give him and his crew of local experts a call. Drop the back side of Mammoth down to Crystal Lake, then hike up the ridge to the top of the Crest. 3-4 hours with snowshoes- less with skins- for a couple of quick descents. You’ll get more for less on the Sherwins. I’ve never done the Negatives, but June definitely has great side country, snow-permitting. Go with a local so you don’t get lost! For a trip really worth bringing a split board, skin up Mt. Tom when there’s enough snow to bury the Elderberry bushes and make it all the way to the base!